157.50 QAYUM & ELAHISONS (PVT)LTD.
Surgical instruments are the specially designed tools or devices for performing specific actions of carrying out desired effects during a surgery or operation, such as modifying biological tissue, or to provide access for viewing it. These medical instruments have been manufactured since the dawn of pre-history. Rough trephines for performing round craniotomies were discovered in neolithic sites in many places. Sell surgical instruments o Export Portal, reveal new methods to grow your export business without borders. Buy medical and surgical instruments on Export Portal, explore the best possibilities of the online shopping! 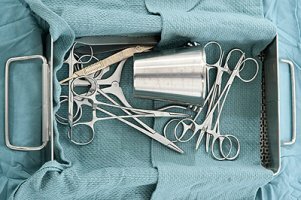 In our internet catalog you can find the following surgical instruments: grasper, clamps and occluders for blood vessels and other organs, retractors which are used to spread open skin, ribs and other tissue, distractors, positioners and stereotactic devices, mechanical cutters and many others. Shop for surgical equipment on Export Portal, find sellers and manufacturers from all over the world. Expand your business globally as success is not for someone else, it is for you!